Like most people, I am a creature of habit. I tend to reach for the same pieces of clothing, fragrance, and make up products over and over. 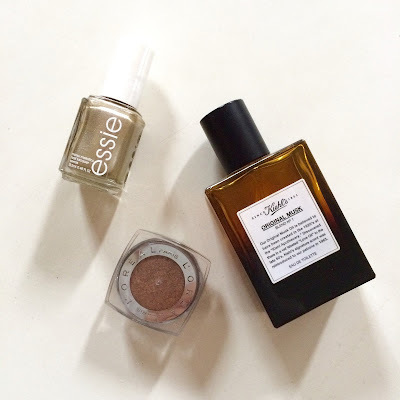 For the last couple of months these beauty products have been my favorites. Essie polish is known for its durability. I became a complete brand addict this summer when I painted my nails the week we moved. After 4 days of packing and moving the polish remained unchipped. This particular shade drew my attention because it can serve as a little bit of jewelry when I'm too lazy to put any on. Such a pretty little touch of metallic gold to accessorize. This whole winter I've been wearing Kiehl's Musk Oil. I like a richer, darker fragrance in the winter and this one fits the bill. I love the hints of jasmine that add a touch of femininity to the deep, sultry musk notes. This eye shadow has an amazing level of pigmentation. Just a little bit is all it takes to create a beautiful day look. I like wetting an angled brush and using it as an eyeliner in addition to using it as an eye shadow to create a smokey look. Such a great product to reach for, for both day and nighttime looks that last. What products have been part of your beauty uniform this winter?